The 802.11ac wireless technology is the 5th generation Wi-Fi standard designed to meet the increasing demand of bandwidth-intensive applications and activities such as high-definition streaming. At a Very High Throughput (VHT), this new standard can achieve a speed of up to 1 Gbps. The 802.11ac wireless technology is available among the Linksys Smart Wi-Fi Routers and only operates on a 5 GHz band. It is also backward compatible with all 802.11a and 802.11n clients. IMPORTANT: Older devices may not be capable of detecting and connecting to a 5 GHz network. If you have a network environment where there are devices that do not support 5 GHz, it is recommended to leave the 2.4 GHz network enabled. Launch a web browser and access the Linksys cloud account by entering “192.168.1.1” or “myrouter.local” in the Address bar then press [Enter]. When the Linksys cloud account login page appears, enter your Email Address and Password then click Log in. NOTE: Setting your Linksys Smart Wi-Fi Router to Wireless-AC Only can be done locally or using your Linksys cloud account. 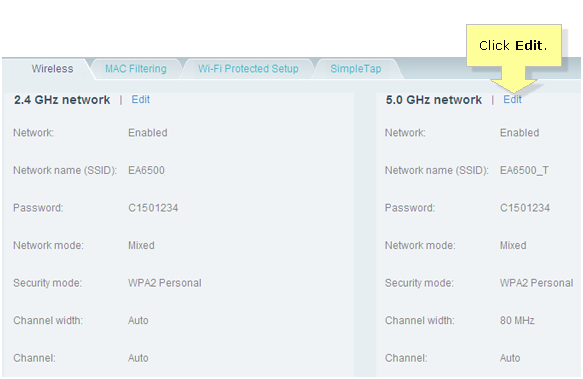 Click Wireless under Router Settings. Click Edit beside 5.0 GHz network. 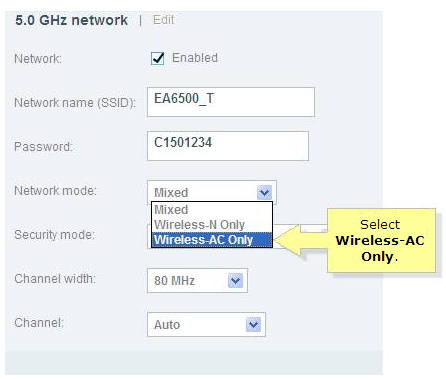 Click the Network mode drop-down menu and select Wireless-AC Only. Click or to save changes. A warning message will then appear to inform you that the changes on the wireless network settings might disconnect wireless devices that are connected to the network. 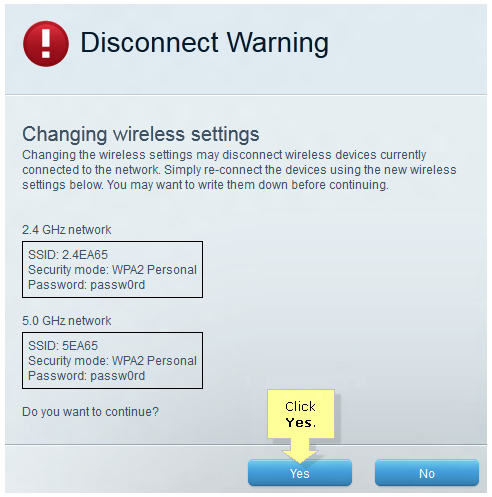 Ensure that there are no wireless devices connected to the network before clicking Yes. When the prompt stating that the changes have been applied appears, click OK to be redirected back to the main page. Once you have set the Linksys Smart Wi-Fi Router network mode to Wireless-AC Only, you can then enjoy multiple HD video streaming, other bandwidth intensive activities, and have the same benefits for smartphones and tablets. QUICK TIP: The performance in speed will be influenced by a number of factors. It is recommended to adjust the wireless channel width and the channel for each frequency in order to prevent interference. To know more, click here.